New Zealand’s Milford Track is one of the best known walks there. This four day walk follows the Clinton and Arthur valleys in Fiordland, in New Zealand’s south Island. From Te Anau a bus transports you to Te Anau Downs wharf where a ferry takes you across to Glade Wharf. The walk begins from there. I have written ‘On the Milford Track’, a useful booklet, with line-drawings, overview maps and a daily narrative. The Milford Track route is 53 km long and for those contemplating this trail for their walking holiday in New Zealand, some planning is required. The path is well marked. The weather in this part of New Zealand is unpredictable and needs to be catered for. Expect to be rained upon! 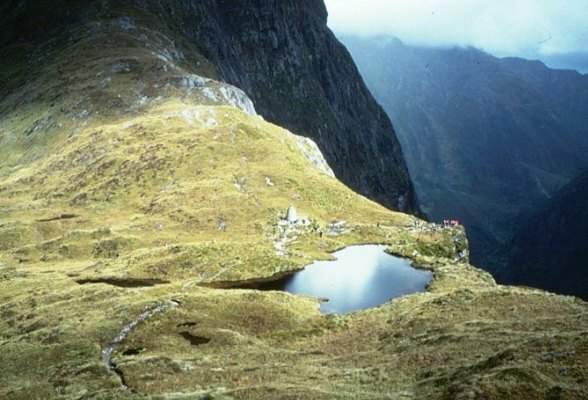 Some general information about the walk: Milford Track Route: Starting from Glade Wharf, independent walkers will stay overnight at Clinton Hut, Mintaro Hut and Dumpling Hut. This is a four day walk through some of New Zealand’s finest areas. Some Highlights: The independent walkers’ hut are comfortable and welcoming, especially if the weather is overwhelming. MacKinnon’s Pass, cheeky Keas (native parrots), Sutherland Falls and the numerous streams which you walk through. The track only accommodates 40 independent and 40 guided walkers per day, so it has to be walked in four days. Luggage transfer: Independent walkers must carry all their own food and sleeping bags. Cooking equipment and facilities are provided at each hut. Your Milford Track Accommodation: Accommodation for independent walkers is in the DOCS huts. Mattresses are provided as well as limited battery lighting, washing up facilities and food utensils. Guided walkers are provided with warm huts, hot food and hot showers. Food: Your choice. Make sure it’s something you like. Take snacks for when you’re on the track. When to go? The walking season is from October to May. The track is closed out of season due to the inhospitable weather. Walking Gear: Good walking boots and socks are critical. Your shoes should have been worn in. Also important is what rain gear to take. Make sure it’s made from a breathable material. This is a superb wilderness walk, so don’t forget to bring your camera. Be prepared for lots of rain and wonderful walking. The track is always walked from Glade Wharf to Sandfly Point.